If you even remotely follow basketball here in the Charlotte region, you’ve probably been inundated with news and discussion regarding a possible ‘Charlotte Hornets 2.0′ rebrand. Many of you can recite the important dates in the Movement’s history like you’d just crammed ‘em in for a 10th grade history exam. Since purchasing the New Orleans Hornets from the NBA, Tom Benson has made it clear that he intended to rebrand that franchise as soon as possible. He literally said this within minutes of his initial press conference as owner. His wife Gayle has since spilled the beans on the new brand’s color scheme (Red, Navy, and Gold) and Yahoo! Sports has since scooped the name (Pelicans). So there you have it. You’re fired up, right? Of course you are. Well here’s the best part: a whole heckuva lot of the push to reclaim our Hornet-identity was generated at the grassroots level, by people just like yourself. I started the “We Beelieve: Charlotte…take back your Hornets” Facebook page close to 3 years ago. 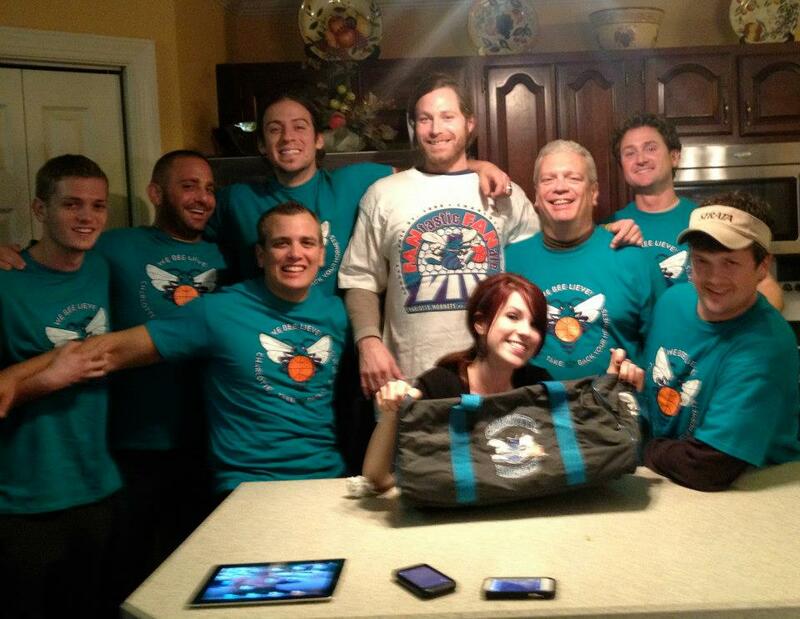 Soon thereafter, I met Evan and Scotty Kent, two brothers who had started the BringBackTheBuzz.com website. Together, we’ve been mobilizing Charlotte’s teal and purple army to rally for Hugo’s return. When we started, there wasn’t so much as a glimmer of hope that the push would ever be remotely successful. Today, we’re on the precipice. But we’re not there yet. This isn’t some sort of hostage situation; ultimately, it comes down to Mr. Jordan making a decision. That being the case, it’s time to redouble our efforts. If you haven’t already, follow us on Facebook and Twitter (@We_Beelieve and @bringbackthebuz). Sign the ‘We Beelieve’ petition on Change.org. Then, start making your presence known. Sure, we want you to spread the word about The Movement via social media, but mouse clicks and keystrokes can only take us so far. Whenever you get the chance, throw on some teal and purple (and if you don’t have any, gimme a holler! I gotcha covered.) and SUPPORT THE B**CATS. Nothing will tell the powers that be that we mean buzzness more efficiently than filling the stands with teal and purple as often as possible. In summation: join the Movement via our various channels. Tell anybody and everybody who listens. And most importantly, support our B**Cats (all while wearing your teal and purple…naturally). 5:00: pregame rally at Fitzgerald’s (right around the corner from the arena). There will be FREE BEER. There will be a HUGO-SHAPED CAKE. Yeah. Perfection. 7:00: we head over to the arena, where we cheer our ‘Cats onto victory against the Sacramento Kings. This is the important part. We did it last year, got about 200 people out, and it really catapulted the Movement into a new stratosphere. Basically, just get your tickets via StubHub or Ticketmaster. We’re going to start in section 205, then move to 206, and so on. This will be a major event, gang. If you’re in it to win it, and you can possibly swing it, do try to be here. 9:30: after a B**Cats/Hornets victory, we head back to Fitzgerald’s for a postgame party. And that’s that. After all the acrimony, sadness, and eventually, apathy, we actually have a shot of rebooting our beloved Charlotte Hornets. Together, we can make Queen City history. Let’s do this. All the naysayers have beeen backing off of early comments made about the name change for two months now. They’re so embarrassing to this community and city they should bee excommunicated. Now true redemption is near!! It’s only a matter of time before the Hornets buzz fills the arena once again with BeeFence, BeeFence!!! Happy days are here again. Its been a pleasure and a blast working with you John and Evan and I can not wait to see it come true. So thankful you and bbtb got this movement going. you guys had the guts to start what noone, including myself, would have done.…so thank you. Creating a buzz for the possible name change will spur an increase in merchandise sales of the current B**cats merchandise for 1. collectors 2. fans who support the current branding. It’s a win-win for team owners to state that they will consider the change. As far as actually changing it I am not familiar enough with brand marketing to say whether the cost (signage, give-a-ways, printing) would actually be more than the benefit. Re-branding them back to the Hornets may spur an increase in merchandise sales, or it may not. Everywhere I’ve been in my takeback tshirts has sparked exited conversation and very high annticipation on an announcement that the Queen Reclaims her Sting!